The name says EGGjactly, but it serves much more than just eggs. One of Gurgaon’s favourite food trucks, you can usually spot it around Sector 29, with a huge crowd around it. 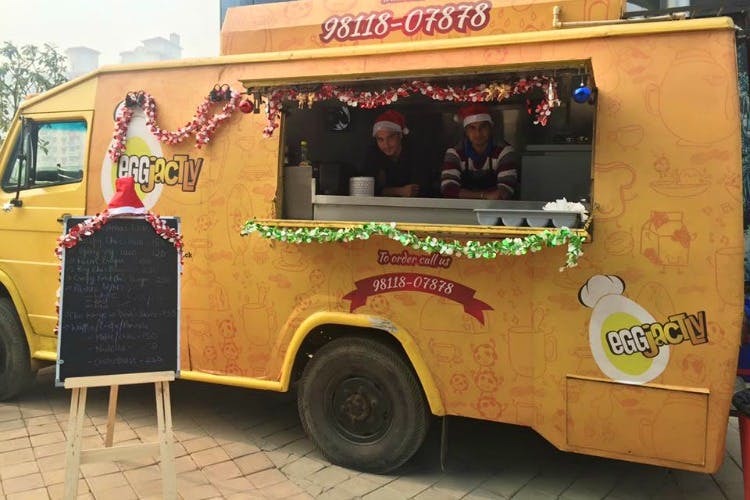 EGGjactly was one of the first GPS-enabled food trucks to be introduced in Gurgaon, and has stood strong ever since. The service is quick, even when they are catering to multiple orders. There is no seating space, so maybe you can choose to chill in your car, or stand next to the food truck while you attack the food. Standing in the middle of all the hustle and bustle and gorging on the food is an experience in itself, though. Everything served here is pretty tasty, but the lamb servings are the ones you should pick. The Messy Burger, with its juicy lamb patty, melted cheese, fried egg, grilled mushrooms and caramelised onions is a must try. If you’re in the mood to challenge your friends to a fiery treat, the Chicken Wings in Devil’s Sauce should be your pick; they are crisp yet juicy, and pack some serious heat. There is not much to drink here however, and we hope new options are introduced soon. This desi version of Chef is just one of the many food trucks in Gurgaon, but we sure can understand why it is a favourite there. We recommend you go there on an empty stomach though,; the portions can be pretty filling.